Own “Every Day” on Blu-ray and DVD on Junes 5, or Own It Early on Digital on May 22! Burbank, CA, April 17 – Experience the most original love story of the year when “Every Day” arrives on Blu-ray and DVD June 5 from Warner Bros. Home Entertainment. The film will also be available early for Digital Download on May 22. From Orion Pictures comes the romantic drama “Every Day,” directed by Michael Sucsy (“The Vow”) and based on David Levithan’s acclaimed New York Times best-selling novel of the same name. The film stars Angourie Rice (“The Nice Guys,” “Spider-Man: Homecoming”) and Justice Smith (“Paper Towns,” TV’s “The Get Down,” “Jurassic World: Fallen Kingdom”) with Debby Ryan (TV’s “Insatiable,” TV’s “Sing It!”) and Maria Bello (“A History of Violence,” “Coyote Ugly”). Sucsy directed from a screenplay by Jesse Andrews. Christian Grass, Paul Trijbits, Anthony Bregman and Peter Cron, produced under the Orion Pictures banner. The executive producers are Marina Brackenbury, Stefanie Azpiazu, Daniel Bekerman, Claudia Bluemhuber, Gerd Schepers and Gero Bauknecht. 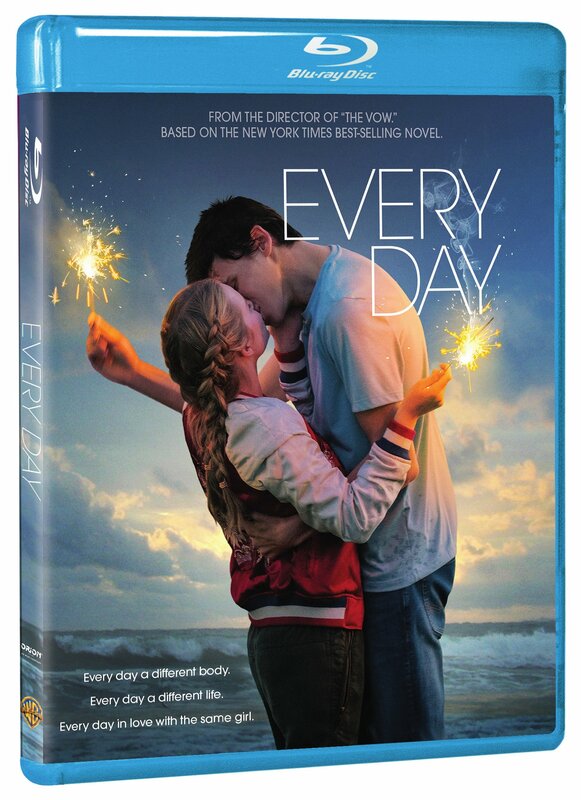 “Every Day” will be available on Blu-ray for $35.99 and DVD for $28.98. The Blu-ray features a Blu-ray disc with the film and revealing high definition special features that take the audience behind the scenes for an in-depth examination of love. Based on David Levithan’s acclaimed New York Times bestseller, “Every Day” tells the story of Rhiannon, a 16-year old girl who falls in love with a mysterious soul named “A” who inhabits a different body every day. Feeling an unmatched connection, Rhiannon and A work each day to find each other, not knowing what or who the next day will bring. The more the two fall in love, the more the realities of loving someone who is a different person every 24 hours takes a toll, leaving Rhiannon and A to face the hardest decision either has ever had to make. An A By Any Other Name – Explore the main character A and how the filmmakers and cast portrayed an entity that wakes up in a different body every day. Love is Love – See what it really means to love another human being, accepting people for who they are. Every Day People – The cast of Every Day provides insight into their characters and the story. Book to Film Adaptation – The cast, filmmakers and author of Every Day discuss the process of bringing the book to life for the big screen. On May 22, “Every Day” will be available to own from select digital retailers including iTunes, Google and Vudu. It will also be available in high definition and standard definition on favorite devices from select digital retailers including Amazon, FandangoNow, iTunes, PlayStation, Vudu, Xbox and others. On June 5, “Every Day” will be made available digitally on Video On Demand services from cable and satellite providers, and on select gaming consoles. Relaunched in 2017 by Metro Goldwyn Mayer (MGM), Orion Pictures is a stand-alone U.S. theatrical marketing and distribution company focused on collaborating with innovative filmmakers with unique voices across all genres and platforms. Originally founded in 1978, the studio’s past releases included crowd-pleasing hits like Dirty Rotten Scoundrels, Hoosiers, RoboCop, The Terminator and the Bill & Ted series alongside such critically acclaimed films as Academy Award Best Picture winners Amadeus, Platoon, Dances with Wolves and The Silence of the Lambs. Orion recently released Michael Sucsy’s young adult romance Every Day, based on David Levithan’s best-selling novel of the same name. Orion also acquired John McPhail’s award-winning zombie holiday musical Anna and the Apocalypse which is set for release later this year.